The French philosopher Michel Foucault’s concept of specific forms of resistance has come to the fore in radical thought, as seen in terrains as diverse as academic social theory and anarchist activism. It has displaced earlier concepts of emancipation rooted in abstract universals (Marcuse), but at a price. Marx’s emancipatory but concrete dialectic of class and ethnicity goes beyond both of these one-sided perspectives. The lecture will be followed by a discussion period when we hope that current freedom struggles relevant to the left in Seattle will be explored in light of the ideas presented in the lecture. We invite workers and activists, especially youth, from a variety of leftist backgrounds to attend and engage in the discussion. Kevin B. Anderson teaches Sociology, Political Science, and Feminist Studies at the University of California, Santa Barbara. 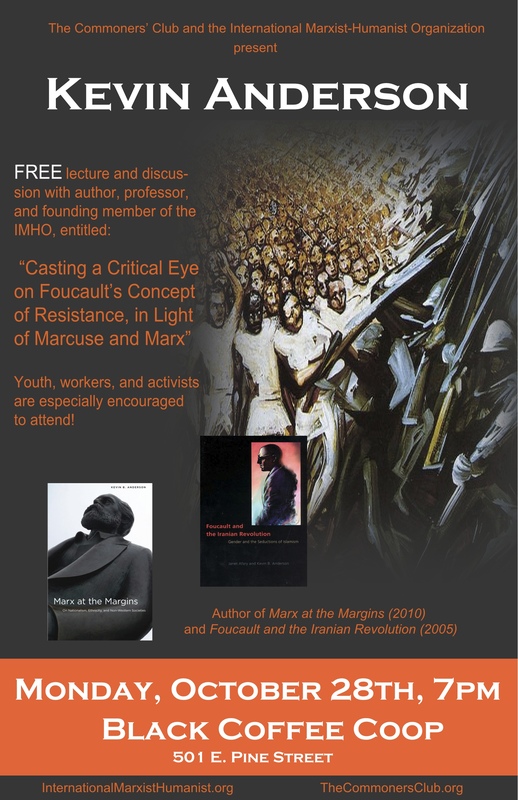 Among his most recent books are Foucault and the Iranian Revolution (with Janet Afary, 2005) and Marx at the Margins (2010). He is a member of the International Marxist-Humanist Organization. This event is co-hosted by the International Marxist-Humanist Organization and the Commoners’ Club. The International Marxist-Humanist Organization (IMHO) aims to develop and project a viable vision of an alternative to capitalism—a new, human society— that can give direction to today’s freedom struggles. The Commoners’ Club is a forum for stimulating discussion relevant to the left in Seattle. This event is FREE but donations are encouraged and relevant literature will be available for sale.